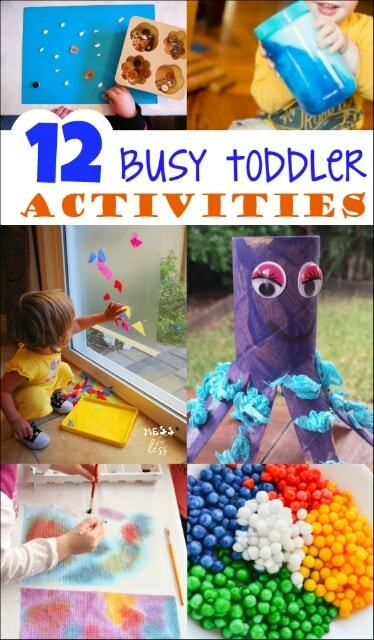 If you have a toddler at home you know that even though they are little, they love to play and create. 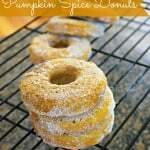 When my little ones were toddlers we did lots of fun crafts such as Making Straw Jewelry. 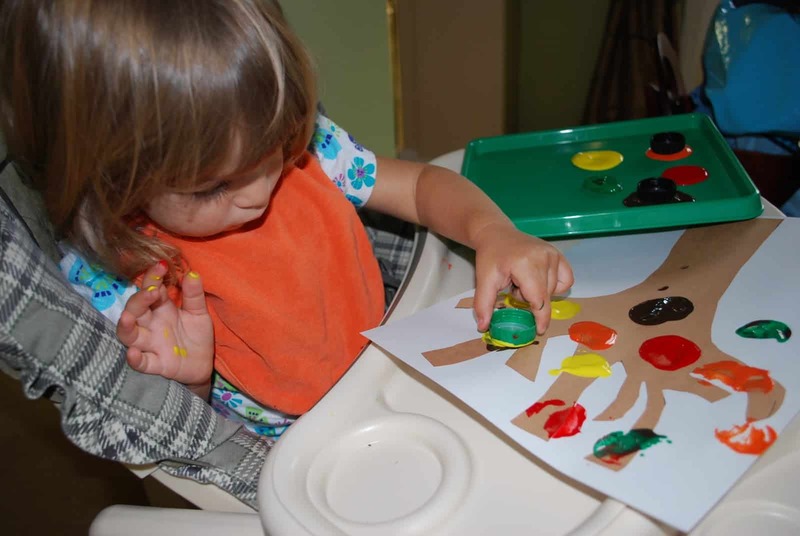 This Fall Tree Craft for Toddlers that my kids made when they were younger was inspired by a fun idea I saw at The Picky Apple where they painted using wine corks. We are not big wine drinkers and didn’t have any corks lying around, so I modified the project to use bottle caps. 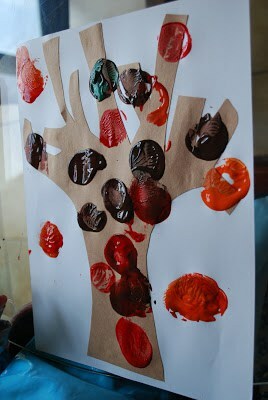 Brown construction paper cut into the shape of a tree. Please supervise your child during all craft activities. 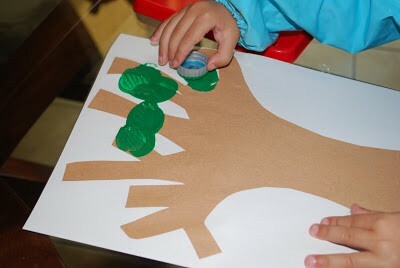 Draw and cut some trees from brown construction paper. I am NOT an artist and think my tree looked sad like one of those Charlie Brown trees, but whatever. 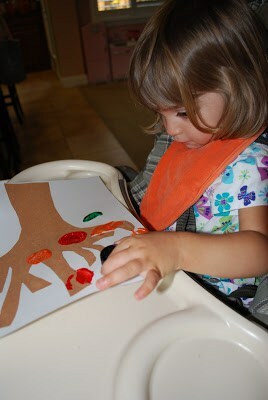 Glue the tree onto some construction paper to make a nice background for your Fall scene. Your child will be stamping some apples on the tree using the bottle caps and Fall colored painted. How many colors you use is up to you. I used yellow, orange, green, red and brown. 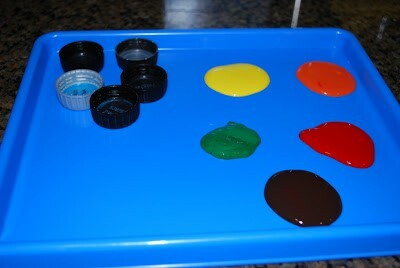 Make sure you have a bottle cap for each color of paint to keep the colors from mixing. I explained to the girls how we were going to make apple trees and there might be some apples in the tree and some at the bottom of the tree. I demonstrated how they could dip the caps in the paint and stamp them on their paper. 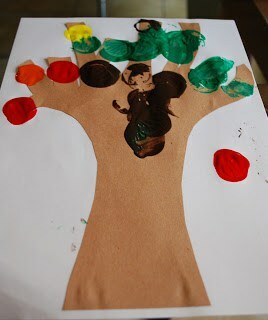 All of the kids started out adding apples to the branches of the tree. 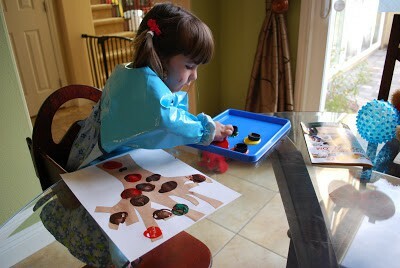 But as they continued, painting was so much fun that they just wanted to keep doing it. Then the kids just started stamping everywhere. So there were apples in the tree, on the ground and everywhere in between. If you liked this Fall Tree Craft for Toddlers and are looking for more fun activities for kids, check out Green Kids Crafts, an earth friendly monthly craft subscription box for kids that sparks creativity while teaching kids a respect and love for the environment. These boxes are themed and each month will be filled with fun projects and creative activities than can be enjoyed by kids from ages 3-10. 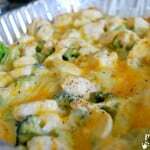 This is the new cool and simple way of doing thing creatively. 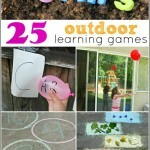 My kids would love to try this simple craft.